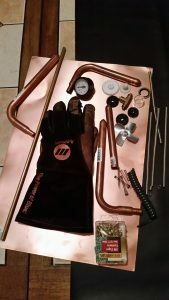 A pair of welding gloves (preferably used) where you’ll only be using one of them. 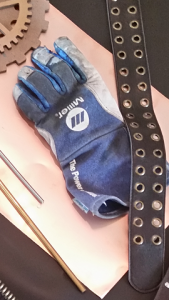 To keep the project on a strict budget, it helps to have found a pair of welding or thick barbeque gloves that are used already. If you don’t have a pair, try finding some at a thrift store and/or garage sale. 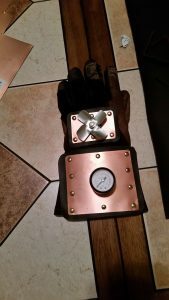 Depending on the color the glove is, you may have to dye it a color that will help blend in with a steampunk look. I used dark brown to mask the blue that I started with. Follow directions on the dye bottle. It took three coats for my glove. I was ambitious and thought I would fit everything on the glove you see in the photo, but once I saw it come together, I was able to weed out what I really needed to make it look proper. Sometimes less is more. Plan out what you want to use ahead of time and it’s okay to have a lot in mind to start with, because you can always decide otherwise. 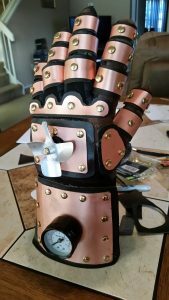 To make this glove look more the part as a mechanical gauntlet, you’ll need to cover it with as much of the copper sheeting and fake rivets (paper fasteners) as possible. What made this a simple and effective build was making each section separately and then adding them on after. The simplicity was with not having to go through the thick glove with stitching, cutting, poking, or threading to the inside. Measure how big of an individual section you want to address first and either mark the faux leather or cut a pattern and then transfer onto the faux leather the shape to be cut out. Cut it out of the material. Next you’ll want to take the same shape of the copper sheeting, but smaller so the faux leather material has a boarder of 1/8″-1/4″ appearing behind the copper sheeting. You should have a thin enough gauge copper to be able to use scissors for cutting. Center cut shape of copper sheeting over top of the faux leather material and plan, mark and space out where you want the rivets to appear along the boarder of the metal. It’s not necessary to glue the metal to the material because the rivets (paper fasteners) will go through and fasten together the two shapes together, but you can if you want so the two don’t move before the process is finished. With the exacto blade, poke through and cut a small slit through both materials where the center of the rivet will be located. Then take a closed paper fastener and poke the shafts through the slit and then spread the shaft apart tightly against the back of the faux leather side. Repeat for all planned rivet spots. Try to plan the direction of where the feet of the paper fasteners will end after opening so they don’t stick out past the boarder of the faux leather material. If that happens though the fastener’s feet are thin enough to cut out of the way. Hot glue assembled sections in place, concentrating on the edges. The fingers are a little more involved since you’ll be making many sections. Each finger has at least two “rings” or copper wraps between each knuckle. 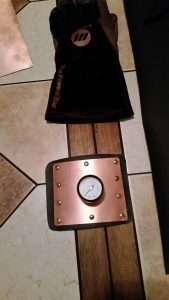 The same principle applies where you have a faux leather backing under copper sheeting strip with only 1/8″ boarder. You’ll need to measure each section of each finger because the length around and distance between each knuckle changes frequently. I did find, however, I was able to use the same measurements for some of the finger sections. Most fingers have only two rivets except the thumb, forefinger and pinky because three sides of the finger are exposed, so I put another rivet on the side for visual stimulus. There should be at least an 1/8″ overlap where the two ends of the “ring” come together where you’ll need to poke the paper fastener through both ends (two layers of faux leather and two layers of copper sheeting). Once you make the wrap held in place by the paper fasteners, you can slide the “ring” in place on the finger. It’s good to have it a little loose with a gap between the glove and the wrap because once the finger is in place in the glove the space becomes filled. I put a dab of hot glue on the underside inside any gap to hold the “ring” in place. Repeat step 5 until all the digits are filled. 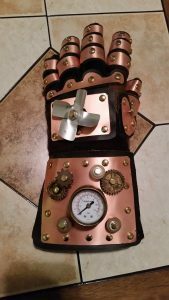 Add any gears, gauges, or cool steampunk related props to the glove for more esthetic purposes. I like putting gears next to each other to give the impression that they are actually turning something. I was able to choose gears that were compatible to my paper fasteners so they actually spin freely. 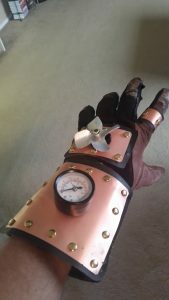 I used Rub-N-Buff on anything that wasn’t metallic looking already which matches the steampunk theme. Follow directions on the package.